Elias Ashmole was a chemist and antiquarian of the late 1600s with connections at Oxford. Some sources have reckoned him to be the first person whose name is recorded as having been made a speculative mason on October 16, 1646 while other sources now propose Robert Moray on May 20, 1641. Neither are identified as the first speculative masons in history  only the first whose names are known. Ashmole wrote his autobiography, published in London by Davies in 1774, with excerpts reprinted in 1966; Clarendon Press, Oxford. Ashmole included in diary materials of the time reference to his having been a member of a masonic lodge. The dates for these meetings are placed at 16 October 1646, and again on 11 March 1682. An introductory article can be found in A Freemasons Guide and Compendium by Bernard E. Jones and there are substantial articles in the Transactions of the Quatuor Coronati Lodge No 2076 UGLE. 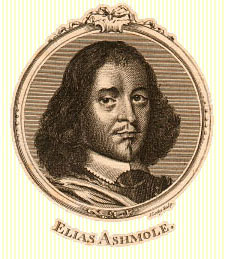 Elias Ashmoles father, Simon Ashmole, was an artisan and a saddler, but he spent more time as a soldier in Ireland and on the continent. Elias implies that he plunged the family into poverty although he did inherit a house from him. He was educated at Lichfield grammar school with legal training in London, 1633-8. Ashmole studied in Oxford in 1645, and was a member of Brasenose College. He took no degree, but he must have developed a considerable affection for the university, as his later benefaction testifies. Oxford conferred an M.D. on him in 1669. Raised Anglican with a strong interest in astrology and alchemy, as well as botany. In alchemy he published Fasciculus chemicus (1650), Theatrum chemicum britannicum (1652), and The Way to Bliss (1658). Ashmole later became a simpler in Oxford and developed a fair knowledge of plants. In 1633 James Pagit, Baron of the Exchequer, whose second wife was the sister of Ashmoles mother, brought him to London to live in his house and continue his education in music. Ashmole studied law with Pagits sons. It seems manifest that the Pagit connection made possible Ashmoles first marriage above his station. In 1640 Lord Keeper Finch employed him for a time until Finch was forced to flee the country. Apparently Baroness Kinderton, whom he met through his wifes family, who were gentry, rather adopted Ashmole, and Peter Venables, Baron Kinderton, became his patron. Ashmole established a law practice in 1638, and for a few years law was his principal means of support. His marrige of 1638 may have provided him with independent means, although this is unclear. Josten thinks that there was no dowry. However, it is worth of note that she was a spinster fourteen years older than Ashmole and from a family of prosperous gentry. In any case, this first wife died in 1641. During the early forties Ashmole successfully insinuated himself into royalist circles in Oxford. The King, in 1645 inserted his name in the commission instead of that of one John Hanslopp who had originally been appointed. A royalist in the Civil War, he was appointed by Charles I to collect the excise in Staffordshire in 1644. Appointed commissioner, receiver and registrar of Excise of Worcester, 1645, and Controller and assistant Master of Ordnance in Worcester, 1646. In 1649 he married a well-to-do widow, Lady Manwaring, who was twenty years his senior; it was her fourth marriage. Her estate established Ashmoles fortunes, even though he ceased to receive the income from her estate after her death in 1668. In every way except for Ashmoles finances the marriage was a disaster. With the Restoration Ashmoles fortunes really looked up. He was appointed Comptroller and Auditor of the Excise and continued with the Excise until his death. Charles also appointed him Windsor Herald in the same year 1660. He was also appointed Secretary and Clerk of the Courts of Surinam (duties and recompense unknown). About 1660 he became primarily an antiquarian. He published quite a few books in that field and gathered a collection that he gave to Oxford, along with Tradescants collection, which had been given to him. Charles II granted him the position of Comptroller and Auditor of the Excise for the city of London in September of 1660, and Comptroller of the entire Excise in October of the same year. This position gave him more than enough money for living. The King also granted him the office of Windsor Herald and full power and authority to keep accounts of all entries, receipts and payments. He was given the right to peruse, to collect, and to transcribe any documents he might wish to use in his work. His position in the Heralds office was strengthened by a royal warrant in the October of 1660 which granted him precedence over the others newly appointed. In 1661 the King also made him Secretary and Clerk of the Courts of Surinam for life. Along with his offices Ashmole performed various commissions for Charles, such as caring for the Kings medals. Ashmole dedicated his book on the Garter (The Institutions, Laws, and Ceremonies of the Most Noble Order of the Garter, 1672) to Charles II, and gave the first presentation copy, richly bound, to the King. Charles granted him a pension of 400 pounds from the customs on paper. In the presentation copies to six foreign princes who were members of the order, Ashmole inserted specially printed dedications to them. From these came gifts of a gold chain and medal (the King of Denmark) and a similar gift from the Elector of Brandenberg. The other rulers also acknowledged the gift. In 1677 Ashmole was offered the post of Garter King at Arms; he arranged for it to be conferred instead on his then father-in-law (by his third marriage), William Dugdale. When his second marriage made him wealthy, Ashmole became something of a patron himself for example to George Wharton, a fellow royalist and astrologer, who dedicated a book to him in 1652. In 1656 Nathaniel and Thomas Hodges dedicated a translation of Maiers Themis aurea to Ashmole. Also a book on astrology in 1657 was dedicate to him, and in 1655 one on plants. And in fact there were quite a few more dedications throught the rest of his life. In 1682 or 83 he bequeathed the Tradescant collection, which he had received, together with his own collection to Oxford - the initial source of the Ashmolean Museum. He was deeply interested in the medicinal uses of plants and a member of the Royal Society in 1661, although not active. Elias Ashmole, 5 vols., ed. with a biographical introduction by C.H.Josten, (Oxford, 1966). Volume one is the biography. Dictionary of National Biography (repr., London: Oxford University Press, 1949-1950), 1, 644-6. Biographia Britannica, 7 vols. (London, 1747-63), 1, 223-36. Compiled by Richard S. Westfall Department of the History and Philosophy of Science Indiana University.